Every kid, young and old, loves watching fireworks on the Fourth of July. Great memories are made while the family enjoys the brilliant, colorful explosions of light. And the noise! We do this piece of art on black construction paper, color the display with oil pastels and then put the sparkle in with glitter glue. The cityscape pattern included, is Cricut friendly. Very outstanding! 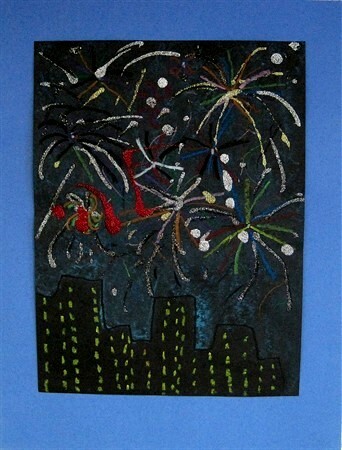 For directions, go to “Fireworks” in the 2nd Grade Projects Gallery in the sidebar. This entry was posted in 2nd Grade, Holidays and tagged 2nd Grade, arts and crafts, arts and crafts for kids, easy art projects for children, fireworks, fireworks art, fireworks art project, fourth of july art project. Bookmark the permalink.